The Wharton Social Impact Initiative is pleased to announce the 2018 recipients of the John M. Bendheim Loan Forgiveness Fund for Public Service. These 17 Bendheim Fellow are examples of Wharton alumni using their skills—in finance, management, marketing, entrepreneurship, and more—for social impact. A look at previous winners reveals a diverse network of Wharton alumni, all lending their business acumen to mission-driven careers in the nonprofit, public, and social impact sectors. Created in 2005 by John Bendheim, W’40, and his son Tom, WG/Lauder’90, and managed by the Wharton Social Impact Initiative, the loan forgiveness fund has awarded more than $1.7 million to nearly 100 different alumni. These Bendheim Fellows are representative of the growing community of Wharton alumni engaged in the business of social impact. 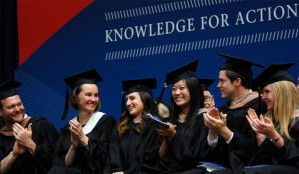 The funding decisions are made by a committee composed of Wharton representatives (Wharton Social Impact Initiative, MBA Career Management, Wharton Financial Aid, MBA Admissions, Wharton San Francisco, and the Wharton Executive MBA program) and previous recipients of Bendheim Loan Forgiveness Awards. Olatomide Awe is a 2017 MBA graduate with concentrations in Strategic Management and Entrepreneurial Management. She is the CEO and co-founder of Colligold Resources, a career-coaching organization that is motivated by a strong desire to prepare undergraduates and recent graduates for employment in Nigeria. Mayank Desai completed his MBA in 2017 with a concentration in Entrepreneurship. In his role as Capital Markets Specialist at the Federal Deposit Insurance Corporation (FDIC), Mayank works to execute the organization’s mission of maintaining stability and public confidence in the nation’s financial system. Nicholas Edquist is a 2016 MBA graduate who concentrated in Finance, Multinational Management, and Entrepreneurship. Currently he serves as a Special Advisor in the U.S. Government. Claudia Gutierrez, MBA 2015, graduated with a concentration in Finance. As Investment Officer for the International Finance Corporation, Claudia assists in the organization’s mission to end extreme poverty by 2030 and boost shared prosperity by developing the private sector in emerging markets. Rashie Jain completed her MBA in 2016 with concentrations in Healthcare Management and Entrepreneurial Management. She is the CEO and Co-Founder of Onco.com, a nonprofit healthcare startup with the mission of connecting cancer patients in developing countries with expert oncologists to receive an online second opinion. Joshua McCann, who graduated in 2014 with a concentration in Finance and Entrepreneurial Management, was a very active social impact student while at Wharton. As an Associate Syndications Officer with the International Finance Corporation, McCann supports the organization’s mission to end extreme poverty by 2030 and boost shared prosperity by developing the private sector in emerging markets. Ashley McLeod graduated in 2014 with concentrations in Marketing and Management. In her role as Strategic Affairs Manager at the Mayor’s Office in the City of Detroit, Ashley assists in the mission to support a healthy and beautiful Detroit built on inclusionary growth, economic opportunity, and an atmosphere of trust. Nimesh Modak earned his MBA with a concentration in Entrepreneurial Management in 2015. In his role as VP of Strategy & Business Development at Imagine H20, he supports the organization’s service as a path-to-market for water innovation through a rigorous business accelerator, providing water entrepreneurs with the resources, insight, and visibility to launch and scale a successful business. Uzo Osikhena completed her MBA in 2013 with concentrations in Finance and Management. As the Regional Head of Anglophone Africa at Aspen Management Partnerships for Health, Uzo supports the organization’s mission of working with Ministries of Health across Africa to support their efforts to achieve universal health coverage. Jodi Reynhout graduated with her MBA in 2016. She currently serves as the Vice President of Administration of Esperanza, Inc. where she assists with the missions of strengthening and empowering the Hispanic community in Philadelphia and across the nation and alleviating poverty by operating educational institutions, conducting economic business and development activities, and providing workforce development and immigration legal services. Margarita Salasyuk is a 2015 MBA graduate who concentrated in Entrepreneurship. She is a Senior Portfolio Manager at Water.org, where she works to execute the organization’s mission of pioneering market-driven financial solutions to the global water crisis. Ricardo Salinas is a 2016 MBA graduate with concentrations in Finance and Entrepreneurial Management. In his role as Portfolio for Impact Program Manager at Overseas Private Investment Corporation, Ricardo furthers the organization’s mission of mobilizing U.S. private capital to help address critical development challenges and advancing U.S. foreign policy and national security priorities. Laura Shen graduated in 2013 with a concentration in Multinational Markets and Management. She is currently a Policy Advisor at the U.S. Department of the Treasury. Mark Spector is a 2015 MBA graduate with concentrations in Finance and Management. As the Senior Vice President of Asset Management at the New York Economic Development Corporation, he supports the NYEDC’s mission to leverage the City’s assets to drive growth, create jobs, and improve quality of life. Katherine St. Onge earned her MBA in 2016 with concentrations in Finance and Management. She currently serves as the Senior Officer of Investor Relations at the Calvert Foundation (recently rebranded as Calvert Impact Capital) where she supports the organization’s mission of enabling people to invest in social good and reducing inequality by providing loans to non-profits, social enterprises, and community development organizations in the U.S. and throughout the world that create measurable social impact. Lorinda Wong completed her MBA in 2017 with concentrations in Management, Marketing, and Operations. Currently she is a Project Specialist at the Getty Conservation Institute, which works internationally to advance conservation practice in the visual arts through scientific research, education, training, and field projects. Justine Wu is a 2015 MBA graduate with a concentration in Management. She is currently a Program Coordinator for the Early Childhood Innovation Network, where she assists the organization in its mission to ensure that all children are able to thrive and reach their fullest potential by taking a science-based and cross-sector approach to strengthening families and the systems which support them, and decreasing the impact of trauma and toxic stress on children.